Help Rudolph and Santa find their way through the maze to the sleigh filled with gifts to deliver on Christmas Eve!! 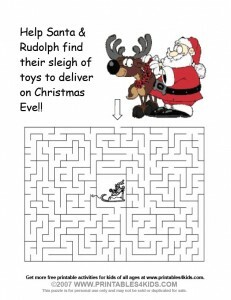 Click on image to view and print full size or download the Santa and Rudolph Maze as a PDF file. Get your Free Personalized Christmas Countdown Calendar, too.